The old saying “A chain is only as strong as its weakest link” can be true for trees as well. A tree is only as strong as its weakest union. An overwhelming majority of trunk, branch and crown failures are associated with a weak area at the point of failure. Include bark, co-dominant stems and cavities are just a few common problems that plague trees. Most everyone knows the exploding nature of Bradford Pear trees. 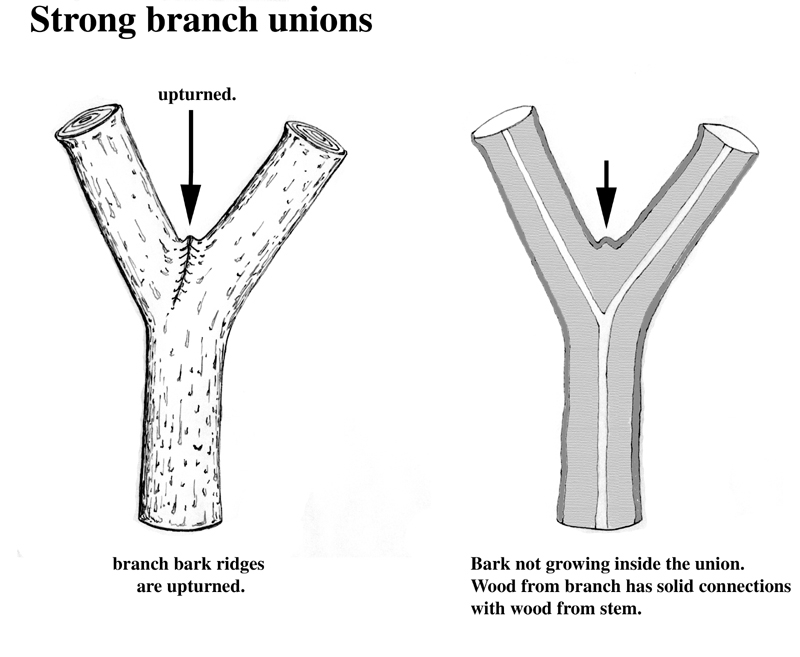 The codominant nature of the Bradford causes the branches to grow together and as a result an area of included bark develops and creates a weak union. This is a prime example of structural issues that can occur with trees. There are so many different defects, factors and circumstances that can compromise a trees structural integrity. 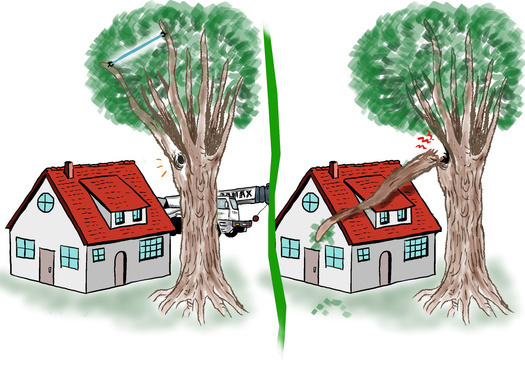 Our Isa certified arborists are experts in identifying these aggravating factors.Once a structural defect is identified, a tree can most often have a supplemental support system installed to mitigate the risk. Each situation is unique and will require the expertise and experience of an Arborist familiar with cabling, bracing, guying and other support systems. The following are some examples of common structural issues and types of systems that we install to alleviate the problem. 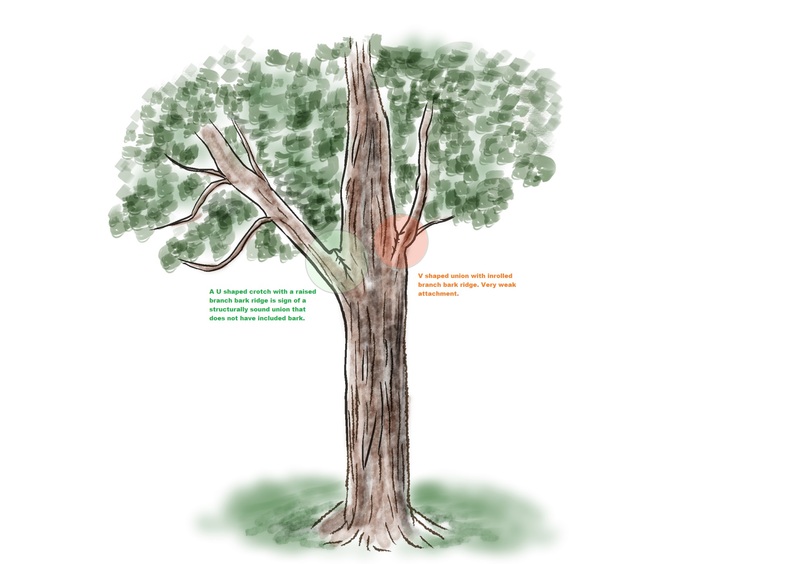 This is the most common structural defect found in trees. The word co-dominant is self-explanatory. Simply put it means two or more stems share or dominate the same base. This isn’t always a bad thing. When inspecting the union point, we check for several things. The first thing we look at is the shape of the area where the stems meet. If the union is in a V shape it is a sign of competition between the stems and poor development of adhesive wood. If it is a U shape there is less cause for concern. 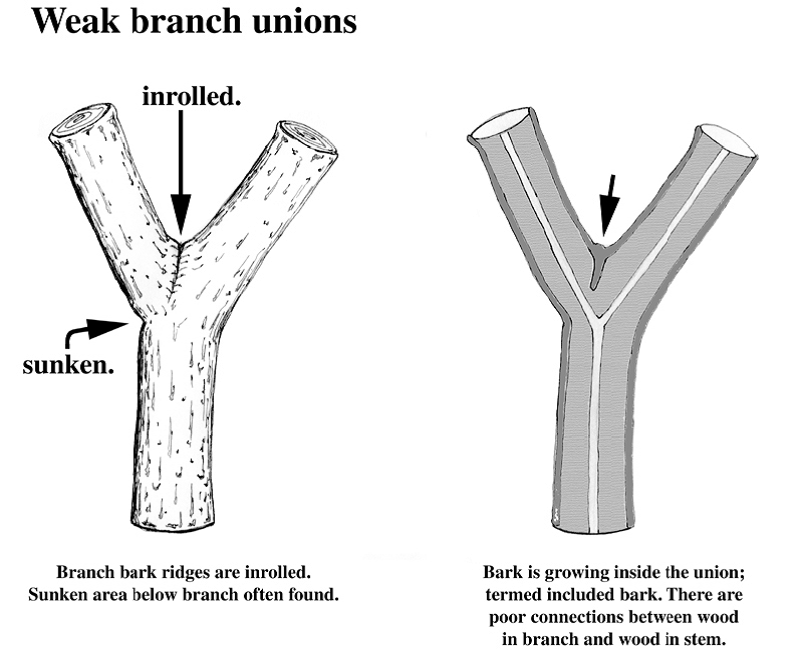 When inspecting V shaped crotches or unions, we look at the marriage line “Branch bark ridge” in arborist speak. An upturn on the ridge is a sign that there is no bark inclusion and an inward turn is signs of ark inclusion. A union with excessive swelling is a sign of reaction growth. We also check for signs of oozing sap or pockets of decay that would further increase the probability of failure. Cracks can develop in codominant unions. They are hard to spot and can even go undetected for years. Scar tissue in unions is a definite sign of a crack that has begun to heal. This scar tissue only helps the vascular system seal itself off and will not a sign of the tree’s structural wood healing. High wind will often cause cracks in a union. Cavities- Holes in branches, limbs or trunks are weak points. These areas can occur for a variety of reasons. Old pruning wounds that don’t heal over, winterization cracks, insect entry points and decay organisms are a few. When the interior wood of a tree is exposed it will begin to rot. This will cause a structural deficiency in that part of the tree. Holes in branches, limbs or trunks are weak points. These areas can occur for a variety of reasons. Old pruning wounds that don’t heal over, winterization cracks, insect entry points and decay organisms are a few. When the interior wood of a tree is exposed it will begin to rot. This will cause a structural deficiency in that part of the tree. Tree cabling is used to support a tree that has a structural defect, such as a codominant union, crack, cavity or other aggravating factor. When wind pushes against the upper portions of the canopy it significantly increases the amount of force and stress on the weak area, and could cause it to fail. 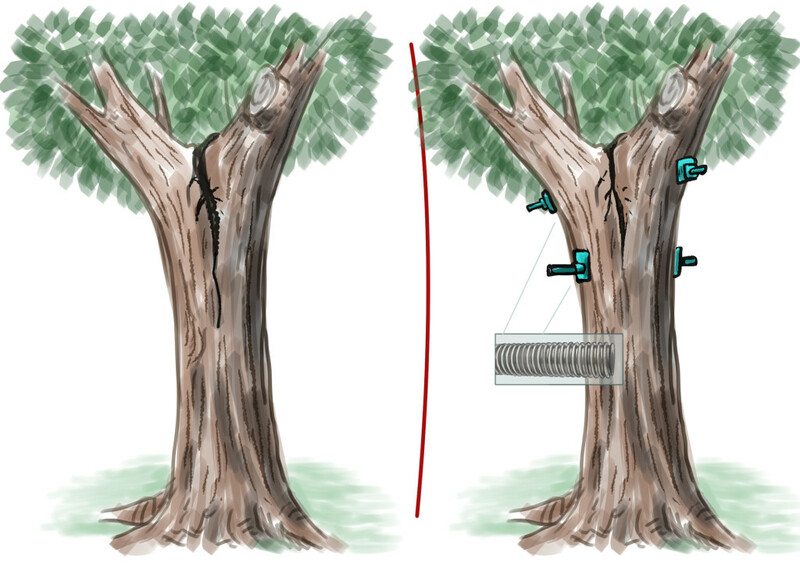 Cabling prevents the increased force by securing the portions of the tree to others. There are two basic types of cabling systems. Static Cabling– Extra High strength (EHS) steel cable that has no give and is used in static systems. 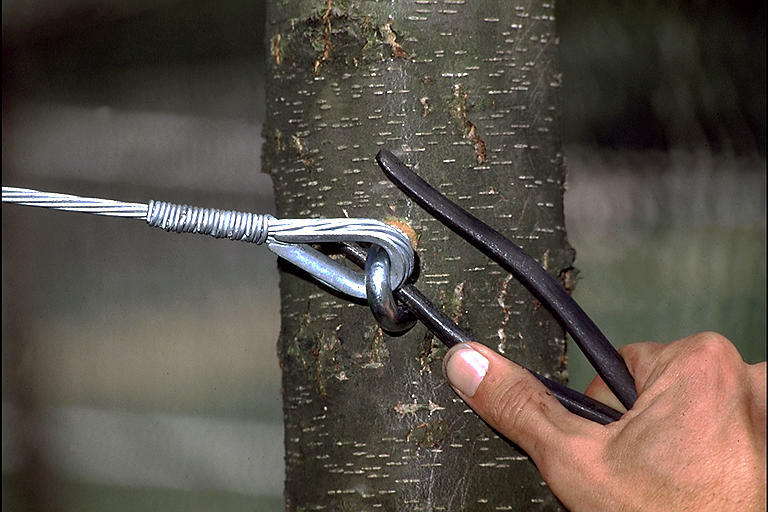 The cable is usually fastened to the tree with steel eye hooks, lag bolts or wire stops. Static systems are usually installed when little to no movement of the crown is desired. The first step in installing a static cabling system is determining the exact point where the cables will be installed. Supplemental support cables are installed 2/3–3/4 of distance between the crotch and the top of the tree or the end of the branch. After the location is determined the fasteners are installed. 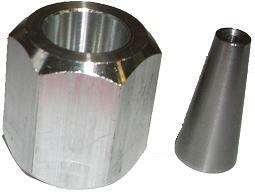 There are three common types of fasteners. Eye bolts, threaded lag hooks and wire stops. We prefer the wire stop connectors. 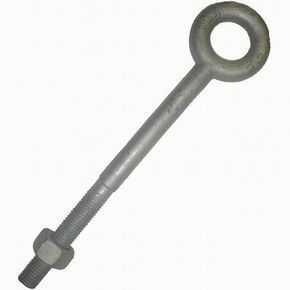 If a through eye bolt or wire stop is used a hole must be drilled and the rod or wire inserted. 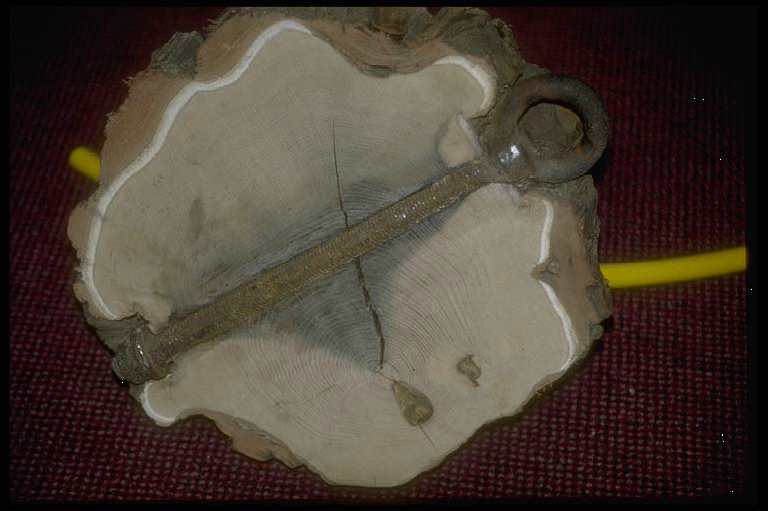 If lag hooks are the type of anchor used they can simply be screwed into the tree. The cable will be measured cut and installed once the holes are drilled. Dynamic Cabling- Dynamic systems use a braided specialty rope with elastic qualities to allow for movement. As trees move with the wind they build more wood. Dynamic systems are a great proactive system to prevent failure but may not be the best for mitigating a tree that has already began to fail. Bracing is usually done in close proximity to the crotch or union. It is a straight forward process. The first step is to determine the number and size of the rods needed to properly support the weight of the stressed parts. If the tree has a significant amount of separation a come- along or other tensioning device will be used to close the crack. Once that is done, holes will be drilled all the way through the trunk(s). The holes are usually 1/16 inch smaller than the rod that will be installed this will ensure a snug fit. After the holes are drilled, the threaded steel rod will be inserted all the way through the trunk(s) and secured with washers and nuts. Cabling is often done in conjunction with bracing. If you feel that your tree is a candidate for cabling and bracing please don’t hesitate to contact us.